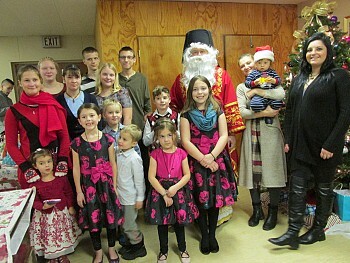 On Christmas Day, December 25th, 2017, after the feast day Divine Liturgy, almost all of our children were present to greet St. Nicholas who was making his annual visit. We have a photo of each child as they received a present from St. Nicholas, and a group photo of most of the children. We also have some photos of a few family groups, some of the adults who were present, and the clergy, standing by the Christmas tree. In addition to St. Nicholas' visit, everyone present had a wonderful time of relaxed fellowship and a tasty Christmas brunch, during which time many gifts were given to each other.